"Making You Move To The Groove!" Mobile disco, with a modern setup (lights, speakers, smoke machine etc). I have a huge variety of music. From the 50s all the way up to Justin Beiber and beyond. Making you move to the groove is what i do best! I'm reliable, professional, and will cater for most events. Required by many venues, Kev&apos;s Grooves has a current PLI policy with Mobile DJ Network in the amount of £10 million. Also required by many venues, Kev&apos;s Grooves has supplied satisfactory evidence of holding current PAT inspections of their equipment dated within the last 12 months. A Method Statement, outlining Kev&apos;s Grooves&apos; Health & Safety procedure for setting up disco equipment has not been supplied. 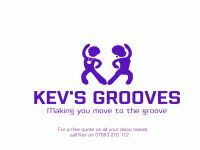 Why do people choose to book Kev&apos;s Grooves? "Kevin was a brilliant DJ from start to finish , he kept in contact all the way up to the event to give me piece of mind that he was definitely going to show on the night. He showed up and set up quickly , his equipment was very professional looking and sounded great. We had given a list of artist and songs we liked and he played as many as he could in the time before packing up quickly and efficiently leaving no mess behind. The only thing I think I would have liked more of is audience interaction, I would have liked him to encourage people to get up and dance. He did however complete any announcements we asked him to make in a very competent fashion I just maybe would have preferred some more microphone work. All in all a great service , a brilliant price and a very friendly person. " "I'm glad you had a fantastic night, and would be more than happy to help again, will definitely work more on the mic Best wishes Kevin." "DJ was great, good stuff Kevin, would definitely book him again. No hassle no fuss, a professional. Recommend." "I'm glad you had a fantastic night, and would be more than happy to help again, Best wishes Kevin." "Amazing night and brilliant DJ Would highly recommend and definitely use again. Not just good DJ but also qenuine, nice and really friendly that really wanted to make my night special x"
Get FREE no-obligation disco quotes from Kev&apos;s Grooves and other DJs covering your venue. Take 2 minutes to fill in some basic details and we'll do the rest! If you are contacting Kev&apos;s Grooves about an event, it's always a good idea to include the DATE, LOCATION, EVENT TYPE, AGE GROUP and TIMINGS to speed things up!